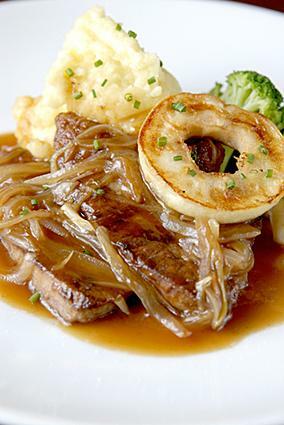 Calf liver recipes are a versatile and flavorful alternative to your typical beef dishes. Liver is also considered to be healthier than most beef products because it comes from a younger animal that has been exposed to fewer hormones and antibiotics, making it a guilt-free choice for many meat recipes. Try the following recipes with calf's liver. Season liver with salt and pepper. Heat olive oil in sauté pan over medium-high heat until it shimmers. Add calf's liver to the oil in a single layer (you may need to work in batches) and brown on both sides. Remove liver from oil and set aside on a platter. Add onion to oil and sauté until it begins to brown, about 5 minutes. Add tomato paste and stir until it begins to brown, 2-3 minutes. Add wine, scraping any browned bits off the bottom of the pan. Add paprika and return liver to pan. Cover and simmer for 15 minutes, until liver is cooked through. Cut liver into slices and season with salt and pepper. In a large pot, cook bacon until crisp over medium-high heat. Remove bacon from oil with a slotted spoon and set aside on a platter. Add liver to bacon fat and sauté on both sides until browned. Remove liver and set aside on platter with bacon. Add onions, diced carrots, and celery to the pan. Cook until vegetables begin to brown, about 5 minutes. Add flour and cook, stirring until flour begins to brown - about 2-3 minutes. Stir in red wine, scraping any bits from the bottom of the pan. Add sliced carrots, potatoes, pearl onion and rosemary to pan. Add bacon and liver, as well as any juices that have collected on the platter. Simmer until stock thickens, potatoes are tender, and liver cooks through, about 5 to 10 minutes. Because the meat of calf liver is so tender and packed with flavor, it can be easily substituted for beef in calf liver recipes like liver and onions or stew. If you've tried beef liver and don't like it, but you've never had calf's liver, then give it a try. You may discover just how good it really tastes.